One week from this Monday, I will be traveling down to Houston for a 3-day recording session on May 24-26 at Rice University’s Duncan Hall. 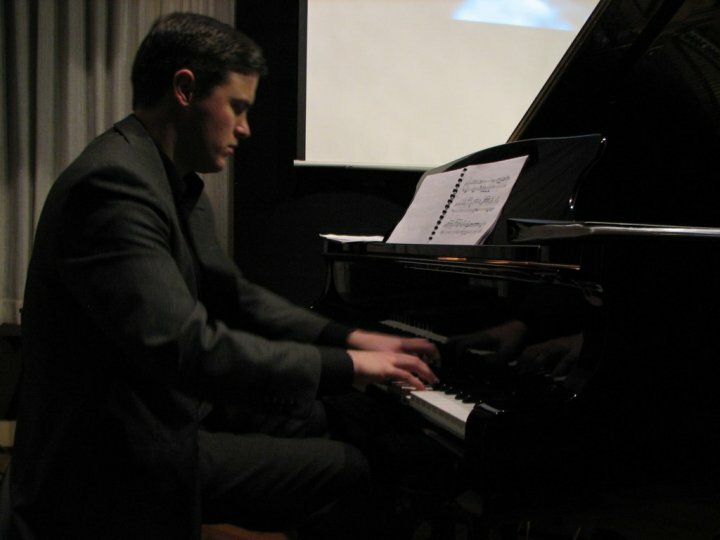 Pianist Ryan Fogg will be recording new piano works by five American composers: Karim Al-Zand (Rice University), Bruce Bennett (San Francisco State University), Joseph Dangerfield (Coe College), Tim Sullivan (SUNY-Potsdam) and myself. The project began in the early part of last year when Ryan, a friend from my high school days, finally agreed to collaborate on such a project. (I put the bug in his ear about a potential project a couple years back.) Earlier this spring, Ryan performed the program at seven different venues across the US. The culmination of the project will be an Albany label CD to be released later this year. I put together a 2-and-a-half-minute montage of the program that gives a sneak peak of the project. I chose 30 of my favorite seconds from each composer’s work. Given the 30-second constraint, I tended to include more brisk and bombastic portions. As a result, you will not hear any of the more delicate and lyrical passages, though each work certainly has them. These excerpts are taken from one of Ryan’s live performances in March and demonstrate his formidable technique. In the first 30 seconds you’ll hear excerpts from two of Karim Al-Zand’s Pattern Preludes, book 2. There are six diverse preludes in this set, each one featuring some kind of pianistic “pattern” (e.g. black notes vs. white notes, symmetrically constructed chords, etc.). But more than being shaped by a guiding patterned principle or “surface texture,” as Karim’s own program note puts it, each prelude possesses a remarkably unique distilled expressiveness as indicated by his descriptive subtitles: “wistful,” “manic,” “delicate, fragile,” “raucous, boisterous,” “placid,” “massive, unrelenting.” The montage contains fragments from Preludes #2 and #6. The second thirty seconds (:30-1:00) are from Bruce Bennett’s Schematic Nocturne, the oldest piece in the set (written ages ago back in 1997…last century!). My primary reason for choosing this 30-second clip is that it features the three primary building blocks of the piece: driving low-register octaves (which by the time this excerpt rolls around have worked their way into the middle register and have splintered from their original octave construct), descending dyads trickling down from the piano’s highest register (dyads which also become splintered at times), and an oscillating, secco major-seventh motive (which opens the entire work). In my mind, Schematic Nocturne is essentially a fantasy in which these three dominant motives (and other subordinate ones) are woven throughout the work’s texture. The third 30-second portion (1:00-1:30) comes from Joseph Dangerfield’s Remnants. While Remnants is in actuality a seven-movement work, the listener would most likely never know its multi-movement structure without seeing the score or reading the program note. The movements are played attacca, feeding into each other seamlessly. In fact, the portion excerpted in the montage extends from the final gesture of movement 2 (subtitled “Time (as movement)”) through nearly the entire movement 3 (subtitled “Time (interrupted)”). The result is a tightly-knit work in which movements 2 through 7 function almost as a kind of reverberating extension or echo emanating from the work’s grand opening with its forceful, chordal constellations. The fourth portion of the montage (1:30-2:00) comes from perhaps my personal favorite section of Tim Sullivan’s Fractured Spaces. Approximately one-third of the way into the piece, the music becomes rhythmically jagged with irregularly pulsing dyads fixed in the piano’s mid-register. This 30-second clip does not do justice either to the unforgiving relentlessness of the extended section from which it’s pulled or to the beautiful lyrical line that follows section—a lyrical version of the work’s hyperactive opening measures. The final 30 seconds (2:00 and following) contain excerpts from two of my own Traces. The first portion you hear is actually from the final movement, which is essentially the first movement in a different guise. Triadically constructed 12-tone chords pervade the movement with select dyads protruding dynamically. The final excerpt comes from final measures of movement 5, a kind of study for the piano pedals, with textures of layered resonances. So there’s a sneak peak into the project which, while perhaps not demonstrating the range of expression in the works and in Ryan’s sensitive playing, I think demonstrates the boldness of the works as well as Ryan’s sparkling performance.